52. Overcoming Hurts & Anger - Dwight L. Carson, M.D. I tend to overlook a book or two, when flipping through lists, so don't be surprised if there are red-highlighted additions, in a few days. What can I say? I needed smiles . . . I found them. I don't remember any books that triggered nightmares, this year, although there usually are a few. Everything gives me nightmares. That's all, for now! I skipped a few categories from my 2006-7 format because I'm tired. I need rest. Nighty-night! I know, I know. Bad Bookfool! Happy New Year!!! For 2009, I wish you many happy visits from the People Who Give Joy to Book Addicts, including the big brown van drivers and the yellow van drivers and the red, white and blue drivers and the FedEx guys (whom I can advertise because my son works for them). I wish you zero visits from the beefy heroes in the red trucks, although it's okay if we all have many muscular sightings, right? We went out of our way to have a fun holiday and staying off the computer as much as possible was one of my commitments. Well, darned if that doesn't backfire on a gal. You guys post too much! There are currently 838 posts in my Google Reader and I desperately want to read them all, but I think it would be best to do a mass-cleaning job and start out fresh. Is okay? Nobody hit little Bookfool? I am working on various catch-up projects and should be back to regular posting, soon. Gah, that all makes me want to take a big nap. My little post-holiday poll will close, tomorrow, then final results should show up. But, I can't say for sure, since I've never done a poll. I feel all fresh and new in a poll-creating way. Most everyone seems to feel deflated after the holidays. Personally, I'm a combination of at least three of those but I lean heavily toward the slashed-pool feeling. If you didn't get a Christmas card from me and you were expecting one . . . well, shucks. Blew it, again. I'm planning to toss together a letter for Old Friends Who Have Ditched Us and The Few Relatives Who Still Remember We're Here, not necessarily including the one who keeps calling and writing because she wants something I took out of my mother's house. What's up with that? Till the funeral, it's like she'd evaporated. Otherwise, I think I may call it a bad card year and give up. . I finished my first read of 2009, this morning: 84 Charing Cross Road by Helene Hanff. Looking for Alaska by John Green - Oh, man. Someone make this guy write faster. Can anyone say "author crush"?? Relax, It's Only a Ghost by Echo Bodine - A very disappointing story of ghost-busting by a chick who sometimes just leaves the ghosts there and calls it a day. Petted by the Light by P. Tobin & C. Doley - A parody of the 90's I-swear-I-died-and-went-to-heaven hit, Embraced by the Light . . . starring cats, particularly a cat named Lucky, who tests the 9-Lives Theory repeatedly. Fifteen Minutes of Shame by Lisa Daily - A tremendously fun, light read about a dating expert who finds out she's been ditched by her husband whilst appearing on national television. How Starbucks Saved My Life by Michael Gates Gill - The memoir of a formerly-wealthy ad executive whose life improved when he got a job at Starbucks. Christmas is over? Darn. I was having such fun. It was my dream to have a client who would fly me business class, but for now the only way I was sitting in business class was if I enrolled in one at the local community college. "You know Waverly, you've got to lower your standards," Davey said. "The way I see it, dating is like being in the jungle. Now a relationship is a vine, and when things don't work out, you're basically hanging a vine that ain't swinging anymore. Now you want to jump to another vine, a healthier vine, a more supportive vine, or maybe a more exciting vine, but if none of the other vines are good enough for you, or if you don't have enough energy to make the jump, you're going to spend the rest of your life clinging to a lifeless bottom of a dead vine just so you don't fall into the abyss below. " He accompanied the speech with swinging ape-like arm gestures and a variety of animal sounds. What led you to pick up this book? I read a very positive review of this book and it was already on my wish list when I was offered a copy for a book tour -- which was supposed to be today. Apologies to the author and tour people. I cannot apparently read a calendar. Describe the book without giving anything away. Oh, this is a hard one to synopsize. Waverly Bryson is dumped by her fiance just before her wedding. She has an okay job, a dysfunctional father who drives her nuts, great friends, and a knack for finding flaws in the men she dates. Will she ever find the perfect life she's hoping for? What did you like most about the book? Maria Murnane is funny. I think that of all the books I've seen referred to as an "American Bridget Jones", this one is probably the closest because Waverly is just so darned fun. She's talented at work but screws up a great deal, personally and professionally. She's endearing and makes friends easily. Her dating life is a freak show. Waverly is a completely loveable, goofy character. And, she drinks too much. What did you think of the characters? I truly loved them all. Even when she described her dating disasters, it was such fun reading that I liked the rejects. Describe a favorite scene. There's a scene at a wedding, with a bunch of single people stuck at a table. They come up with a way to fill the time by listing "things that will exclude a possible date from consideration". What a great scene. But, honestly, they're all great except for the drunken heaving and that never thrills me. Was there anything you didn't like about the book? I could say things fall into place a little too easily for Waverly, but that's not really true. More like . . . when they go right they really, really go right. She's sort of a classic chick-lit type of character, but the writing is better than most; Waverly is witty and fun. Wait? Was I supposed to find something wrong with the book? Nope, can't do it. I loved this book. Recommended? Gosh, yes. Buy this book if you love chick lit or need a light read or an upper or just want to feel like, "Hahaha, my life is better than Waverly's because I got a guy without having to go through all that." It's just loads of fun and very original. Absolutely not a chick lit ditto book. In fact, even if you hate chick lit I'd still say give it a try but be forewarned that if you hate to smile you're in trouble. It's either self-published or small press (sorry, too lazy to look that up) but it's better edited than most big press books and . . . well, maybe one tiny thing I dislike is that people are always asking Waverly if she's all right because there's a bit of slapstick. But, I loved it. Highly recommended. Anything else worth mentioning? The book arrived with a sweet note saying this is Maria's first book and she's very grateful for the reviews -- from Maria's husband father (oops, Maria corrected me). How cool is that? I just think that's ridiculously sweet. Cover thoughts: Hmm, needs work. I think, actually, the title is pretty dull. "The Misadventures of Waverly Bryson" would have been great, if you ask me. My opinion. The cover could stand a picture, also. The little memo page is just not memorable. I know I'm supposed to be taking a break from blogging, but there's one more thing I have to mention. Chris of Stuff as Dreams Are Made On sent me a Christmas gift and it was just the coolest gift that I have to mention it and say thank you for the hundred-thousandth time to Chris. He sent me a copy of Paper Towns by John Green!!!! Seriously, I squealed and bounced and squealed some more. The guys were ready to gag me (and the husband actually put his hand on my head to get me to stop bouncing), but it was at the top of my mental most-coveted books list and, honestly, how could I not? Thank you, Chris!!! Also, thanks to Jessica for the reminder that it's not just Christmas season. Happy Hanukkah!! I forgot that I have a book tour, tomorrow, so there will be one post coming up. Thanks to all for the Christmas greetings! We have something weird going on in our den, at the moment (puddles -- little cold puddles . . . no idea where they're coming from, although the roof is new, so it's not from above), so please pardon me if it takes some time to reply to comments! I have to clear out the den to make sure it's just in those few little spots. No Sunday Pie, today, because we had a very busy day of cleaning, shifting and tossing out. The cat's not in focus, but here's Miss Spooky relaxing with Snowman in the glow of our Christmas tree. See the little bird ornament? It has a tiny tag that says "bird bath" and he's sitting in a bird bath, brushing the feathers of his back with a toothbrush. We've really enjoyed our candy cane/bird compromise tree. Here's a full view of our tree. The funky 70's-looking thing at the top is really just an ornament; but, I liked it and nobody else cared what ended up as a treetop. The bird ornaments don't show up well, as I expected, but Debi asked to see the whole tree and here 'tis. I'm going to take a week off from blogging to finish cleaning up and enjoy having the family around. Merry Christmas and Happy New Year to all my wonderful bloggy friends!!! Care threw me over the edge; I've had such fun reading this meme at other blogs and just loved her answers, so I decided to join in. The things I have done are in BOLD. Wow, more than I expected! I need to spend more time bopping around Europe, apparently. What the heck is that???? [below] A space on a bookshelf in Bookfool's house??? Don't worry. I fixed that problem really fast. David Shibley is founder and president of Global Advance, a ministry that trains and resources thousands of church and business leaders every year in many of the world's most underserved nations. Having ministered in almost 60 nations, David has a passion to strengthen and encourage national leaders to advance God's kingdom worldwide. David and his wife, Naomi, have two married sons. Jonathan Shibley serves as vice president of Global Advance. His primary focus is directing the Marketplace Missions program for equipping business leaders in developing nations. He also is engaged in international business. Before joining Global Advance, he earned a business degree from Baylor University and served with Promise Keepers and Teen Mania. Jonathan and his wife, Sarah, have three children. The often-quoted maxim – “You make a living by what you get, but you make a life by what you give” – is true. Here are seven practical benefits of giving for God’s Kingdom purposes and the fulfilling of the Great Commission. Your gift goes where you may never go. Your gift is an extension of yourself. You receive money in exchange for your investment of time and life. So when you give for Kingdom purposes, in a real sense you’re giving a part of yourself. Your gift says you want your life to count for what is eternal. Americans are generous, and Christians in America are especially so. There are many legitimate causes, but I don’t know anywhere givers can get more done for the dollar than in giving to world missions. Giving living loosens the grip of materialism. I noticed a bumper sticker on the back of a sports car that read, “The man who dies with the most toys…wins.” But Jesus taught that the man who dies with the most “toys” is a short-sighted fool. It’s time for us to stop loving cars and clothes and start loving countries! If God so loved the world that He gave His Son, we need to so love the world that we invest in being sure everyone everywhere hears about His Son. I’ve driven through the poverty-drenched streets of Kolkata and the wealth-lined avenues of Beverly Hills. In both environments I saw desperate people. Jesus wasn’t kidding when He warned, “Beware of covetousness because one’s life does not consist in the abundance of things he possesses.” God calls us to embrace biblical prosperity while rejecting materialism. We can do both; we must do both. You experience the eternal principle of sowing and reaping. Some churches in Africa practice a unique form of church discipline. If a professing Christian is living in sin, he is allowed to come to church, but he is not allowed to give! When the offering place comes to him, the usher places his hand over the plate and prevents him from giving. It is a powerful statement that the blessing of God is literally being prevented from coming to the unrepentant man’s life. It’s an eternal law woven into the very fabric of the universe. Farmers call it the law of sowing and reaping. Scientists refer to it as cause and effect. It’s reinforced throughout the Scriptures. The pattern is clear: you must sow in order to reap. It just works that way. Where your treasure is (present tense), there your heart will be (future tense). Although “you can’t take it with you,” you can send it on ahead! This very day you can lay up treasures in heaven. God will supply your every need. Are you ready for a jolt? Philippians 4:19 is not a promise for every Christian. It’s a great verse: “My God shall supply all your need according to His riches in glory by Christ Jesus.” But it is not a carte blanche to be claimed at will by anybody. No, this promise is given exclusively to those who invest in advancing the gospel. Read the context. Paul told the Philippians they were the only church that had invested to send him on his first missionary journey. As a result of their gift to launch Paul to the nations, he promised that God would supply their every need. Yes, you can claim Philippians 4:19 if you give for the advance of the gospel. You experience the joy of making a difference in the world. I make no apologies for challenging American Christians to tear loose from some of their money and give it to advance Kingdom causes worldwide. Jesus taught, “To whom much is given, from him much will be required.” With blessing comes accountability. There is a longing inside every true Christ-follower to make a difference for Him. We do not bear sole responsibility for world evangelization, but because of our affluence and influence, we do bear heightened responsibility. You experience the significance of participating in God’s global purposes. A businessman thanked me for the opportunity to give to Global Advance. He tearfully said, “You give me purpose.” For this man, building his company is not the bottom line. He goes beyond the bottom line to build Christ’s Kingdom through building his company. You move past mere success to true significance by aligning your life with God’s primary purpose. God’s primary purpose is to see His Son known, loved, and worshiped by redeemed people from every tribe and nation. And you are part of that plan. Live to give. Pray: That God will make you a joyful giver to His Kingdom causes. Act: Where is the Holy Spirit directing you to invest for Christ’s Kingdom today? Bookfool's review: I would like to go into more detail, but I'm not sure whether or not a separate post fits the rules of this tour group, since I'm new and neglected to query in plenty of time for this post. I really enjoyed this little 39-chapter Christian business-person's devotional, although I occasionally found the author stated opinions with which I found myself disagreeing. The 5th chapter was my personal favorite, about having the right attitude toward money, not being arrogant or placing your trust in always having money, if you've got plenty. Very relevant to the times. The 37th day bugged me because it was directly solely at married men; it could have been altered to include a wider audience but was primarily about treating your wife right. Nice, but not applicable to the female crowd, whether married or not, or to unmarried men. I considered Marketplace Memos average to slightly above average reading. There is an extensive list of referenced scriptures in the back of the book. Although I considered the book a so-so read, I believe I'll reread this one and possibly do some highlighting and note-taking. It would make a nice little personal study to expand on the chapters by writing out those scriptures and looking up a few historical characters that were unfamiliar. Self-interview time because I'm bored with myself. I just am. This time, I take the lead. Or I takes the lead. Or . . . well, whatever. I: What possessed you to acquire a book with a duck on the cover? Myself: A moment of insanity? I: Bad start. Be serious, now. Myself: Okay, then. I have no earthly idea how I found this book. I placed it on my wish list due to a recommendation by some stranger or blogger or alien, somewhere, and eventually acquired a copy. It's possible that it was one of those, "If you like this book, you'll love --" suggestions. Those things can get you into terrible trouble, but I've discovered some interesting reads because of chain suggestion ("If you like this then you'll like that; and if you like that then let me show you these . . . "). I: So, tell us about the book without getting all weird and going off on tangents. And, no quacking. Myself: (???) Enslaved by Ducks tells about the author's metamorphosis from pet-free life in the city to life in the country with a growing menagerie of tropical birds, water fowl, cats, rabbits, and other beasties (heavy on the avian life). It's a lovely tale of how one man learned about the joy one receives from animals, especially once you become truly devoted to them. Payback, in other words. He seems to have glimpsed intelligence in all of them -- even the turkeys, although turkeys are apparently really stupid. I: What did you like most about this book? Myself: It's witty, sweet, touching, sometimes sad . . . a great blend. It's just lovely the way the author not only put up with his wife's yearning to acquire animals, but eventually became an enthusiastic, devoted, hard-working pet owner. The effort they put into caring for their pets is astounding. And, I think I can safely say I'll never look at a duck, goose or starling quite the same way. I: How did you look at them, before? Myself: Photo opportunities, from a safe distance. Now, I'll probably be a little more observant of their personalities, as I am with the neighborhood cats. We'll see. I: There's a personal story tickling your fingers. Go ahead, let it out. Myself: My brother-in-law's family used to keep geese and ducks when they lived in a rural neighborhood in the Denver area. We went to visit and I was kind of stunned to see that they left their sliding door to the kitchen wide open, so that the animals just trotted inside (and pooped all over the floor, which was fortunately not carpeted). I'd never realized waterfowl can have such distinctive personalities. And, then, of course I promptly forgot about that experience . . . the other bit stuck with me. It's possible Me, Myself and I were responsible for the death of one of those animals to a marauding neighborhood fox, although I was absolutely certain I closed the barn door. Myself: Yeah. How do you atone for a dead goose? I've never figured that out. I: Was there anything you disliked about the book? Myself: Incessant wit occasionally annoys me, so there were times I had to put the book aside for a while and read something else. But, let's face it -- I do that all the time. There's really nothing to dislike about the book. Les thought the author should give up and get a dog. I didn't feel that way at all. It's really about how he not only adjusted to pet ownership but came to truly love his pets; and, I think you just have to read the entire book to understand how deeply the animals touched his life and changed him. I: To whom would you recommend this book? Myself: Animal lovers, in general. Please bear in mind that he does seem a bit cynical about the whole pet-ownership concept, at first, but it's a very sweet tale about how Bob grew to love his pets. 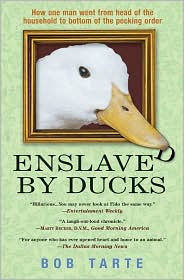 I highly recommend Enslaved by Ducks. Myself: Bob Tarte has recently released a second book, Fowl Weather. I will definitely read it, although it might take me some time to get around to it. If you're looking for a last-minute gift for the animal obsessive in your family, you might as well support the author and buy both. Heck, why not? He's a good guy. You could help save a turkey (or a starling or who knows what) by purchasing his books. And over time, I have found myself thinking of them less as "animals" and more as beings, as little packets of alien intelligence. People who hunt for sport probably never consider the deer or turkey they're about to blast to smithereens as a unique individual. But pat the hunter's hound on the head, idly suggest that one of these days you'd like to bag a dog with a .22, and expect a heated discussion. Viewed from an emotional distance, animals do tend to blend together into an undifferentiated mass, like a crowd of spectators at a football game. Yet even a common-as-mud pet like a parakeet will reveal a vivid personality if you pay close attention. African gray parrots are prone to vitamin deficiencies that can lead to health problems if the bird is restricted to a seed diet, so we were only too happy to provide the pasta, tofu, and Jell-O that a wild bird would have scavenged from the forest. Linda had always lived out in the country, and that was a big difference between us. Her past included subsistence living with a pig and several chickens in the Michigan north woods, while I had merely lived with Catholics in suburbia. Using a long-handled net from a catfish farm, Rupert Murdoch dipped into the Cayuga pen, cornered the female, and with a twist of an arm, scooped her up. "You don't want her flying nowhere," he stated. When we nodded our agreement, he deftly plucked five primary flight feathers from her right wing. The duck never even flinched.
. . . speak with a soft voice, and you might be rewarded with the close approach of a goose. She might even let you touch her. And you had better treasure the gift. Too suddenly and too often, they leave us. It's then that we realize most sharply the subtle comfort of our animals' companionship. It's then that we know that we can't live without them, even though we sometimes must. Wahoo! for snowflakes, even if the best we can do is plastic. I love even fake snowflakes -- paper, crystal, plastic . . . you name it. Wahoo! for compromise! We now have a tree with a combination of little birds and candy canes (the red blurs). Everyone's happy. I bought enough candy canes for the kiddo to set aside a little pile to eat, so he won't be stripping our tree, at least for a few days. Wishing everyone a wahooey day and a charming Christmas season! Last year, we didn't really have a Christmas tree at all, unless you count that little two-foot fake thing in a gold-painted styrofoam pot that I stuck on the dining table. Thanks to my mother's illness, we had no time to shop, no time to even drag out the little laser tree, certainly not a spare minute or the energy to decorate. Christmas was a total dud. This year, I said I wanted to do it right. Kiddo had admitted to feeling let-down by the lack of tree, decorations and gifts in 2007. And, none of us wanted to sit around feeling our losses; instead, we wanted to focus on the magic and beauty of the season. So, we decorated the porch. Hubby kindly bought a tree that fit my specifications. There are things under the tree. The one thing that's not quite going my way . . . decorating the tree. I had this visual image of the colors, the style, the glistening light bouncing off crystal and blah, blah (primarily because I'm accustomed to nobody else having any interest). Before we even finished putting the second strand of lights on the tree, kiddo had thwarted my plan by hanging up a dozen candy canes -- nowhere close to that little decorating dream of mine. Just as I'd adjusted to the idea, he showed up in the office with a candy cane in his mouth. "Wait!" I said. "You can't eat the decorations!" The long-suffering teenager gave me that look . . . you know, the look, and said, "But, you didn't even like them. You called them . . . what was the word?" "Something like that. You asked for it." I suppose I did. So, now, the question is whether to just wait for him to consume the decorations and then start over with the pretties I really wanted to put on the tree or give up and watch as the tree is slowly stripped. I'm still thinking. 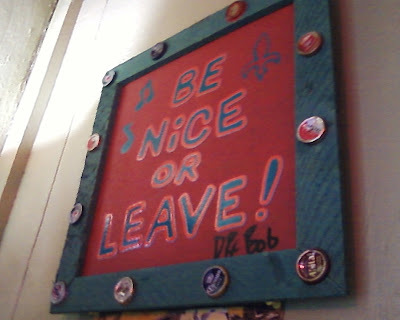 No real pie, this weekend (darn -- the strawberry rhubarb is all gone), just a jumble of life . . . and I haven't sat down to make a button, so you're looking at one of Bookfool's outdoor decorations instead of anything pie-oriented. Yes, it's true; we have a light-up deer with a moving head standing smack in the middle of our monkey grass. He's kind of cute, really, even though I never would have thought to buy a light-up deer, myself. It's the husband's doing. Speaking of the husband . . . I had him string some new snowflake lights across the porch and he opted to add the deer, plus colored lights on each of our two porch columns (which sounds uppity, but it's not a big porch). He asked me to look at the lights before he was completely finished and asked, "What do you think? Are we veering toward white trash, here?" Snort. Actually, it looks really pretty. We've only decorated the porch, not the entire length of the house, and I think it's kind of nice -- probably good that we're not being entirely Scroogey, for once, when you get right down to it. We are immersed in cleaning, decorating, tossing out possessions, folding laundry, wrapping gifts, yardwork, moving furniture and trying to clear out our floorless den in preparation for painting and reflooring. The reading has suffered a bit, although I did manage to finish three books and review them all, this week, so I'm happy about that. Fear in North Carolina: The Civil War Journals and Letters of the Henry Family - I set this one aside for a week, thinking I'd seriously better focus or I was never going to finish any of the books in that 7-book pile I was juggling. It worked; I managed to complete and review three books. Now I can read about Cornelia Henry's life, again. So far, I'm finding it interesting the way Cornelia wrote about everyday life as a wife and mother, life and death around her, news about the war, weather, problems with the servants, etc., in a clipped manner and yet managed to record just enough info that the reader feels acquainted with her. Of greatest surprise has been the amount of sewing she accomplished -- typically an average of at least one or two items of clothing per day. So far, they've had a terrible time getting the loom to work right. Queen of the Road by Doreen Orion - About a road trip in a luxuriously converted bus. I've only read a few pages, but will focus more on this one during the coming week. We just left the UFO Festival in Roswell, New Mexico -- I'm still on their practice run in the new bus-slash-home-away-from-home. I was particularly fascinated by the way Orion's husband insisted that she shouldn't make eye contact with anyone at the UFO Festival. Enslaved by Ducks by Bob Tarte - Nearly finished with this raucous tale of pet ownership, but I have a headache and can't guarantee I'll be done with it by the end of the evening. Still fun, although occasionally the author's sense of humor gets a tiny bit tiresome. I should note that it's typical for me to become weary of consistent wit; even Dave Barry gets to me, after a while. And, I love Dave Barry. 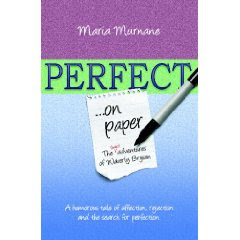 Perfect on Paper by Maria Murnane - Just started this one, a few days ago, although I haven't gotten far, simply because my reading has been so sporadic. I've been pleasantly surprised. It's not trite or redundant for a chick-lit type of book, in my humble opinion. The writing is excellent and so far it hasn't been overly predictable. Marketplace Memos by David and Jonathan Shibley - I think this is made to be read as a devotional, but I never read anything in the morning and every single day, the way I'm supposed to. I read a chunk when I feel like it. The jury is still out on this one. Hurricane of Independence by Tony Williams - It may simply be the timing, but this book is not grabbing and holding my attention. I'm going to give it a few more days and if I can't get into the book, I'll pass it on. I just realized Queen of the Road is not in my sidebar, so I'll have to amend that. Maybe tomorrow. The migraine fuzz is starting to really get to me. I think I'm going to clear off a space on the futon (I've been using it as a folding table) and read. Hope everyone's had a great weekend! 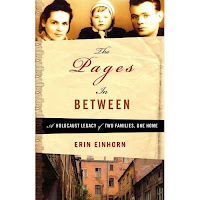 Subtitled "A Holocaust Legacy of Two Families, One Home," The Pages In Between is less a story of the Holocaust than it is a daughter's search to uncover the remarkable story of her Jewish mother, who was hidden in Poland during WWII, and her family's far-branching roots in the area. What led you to pick up this book? WWII is one of my fascinations and this book was showing up all over the place. I just couldn't stand it; I had to read it. Describe the book without giving anything away. Well, hmm, I'm not sure what could be referred to as giving anything away, but I'll separate anything that could possibly be considered a spoiler. The author's mother was a baby when her parents were shipped to Auschwitz -- she was not with them when they were herded onto a transport train. Erin Einhorn's grandfather, however, managed to escape from the train and stayed free just long enough to spirit his daughter into the hands of a Polish woman who agreed to hide her. He survived the war, retrieved his daughter and eventually moved to the U.S. with daughter Irene and a new wife. Irene never really said much about her escape, instead brushing off her daughter's inquiries. The majority of Jews of Polish ancestry probably spend a week or two seeking out answers in the country. The author, a journalist, took a year's leave of absence from her newspaper job and moved to Poland, instead. As she uncovered her family's history, she ran into some interesting complications and I truly don't believe I can describe this book without mentioning the tragedy that hit her family, so . . .
. . . During her year off, Einhorn's mother died. I think it's important to mention because the author found and met the son of the man who saved her mother from the Nazis, but -- here's where it gets weird -- the woman who sheltered baby Irene took compensation for hiding the child and the compensation was major: a complex of buildings owned by the child's father's family. There are some other twists and turns, but the reason I think it's important has to do with the fact that eventually the story focused as much on her effort to regain ownership of the building as it did on the family history. Okay, you can uncover your eyes, now. What did you like most about the book? In a way, it reads a bit like a mystery as the author began to dig for the truth about her mother's past and discovered not only some very fascinating bits of family history, but also that some of the family legends and a few of her mother's memories were not accurate. How did you feel about the real-life characters involved in this author's tale? I got so darned involved. That was good; I really wanted to learn about her family's history. And yet, there were some things that bothered me about the people. It was really very difficult to tell whether or not the Polish family who took in Einhorn's mother did so without the simple ulterior motive of acquiring property. And, yet, you have to admit that matters little when the result was the sparing of a life. And, then there's the author. She is probably a very nice person, but she came off as whiny and obsessive. I say she's probably nice because it appeared that she made friends easily and you have to admire her diligent efforts to uncover the truth. But, it was kind of hard to tell just what on earth she was really after. I guess in order to understand my own feelings about her search, you have to understand that my mother was similarly secretive about her past. And, because I've never felt compelled to dig further, I found it a little bizarre that the auther was obsessed enough to actually move overseas. Overkill? Hard to say. I don't think we all necessarily feel the same need to uncover family secrets, so I respect her burning need to find answers. Was there anything you didn't like about the book? The whole mess about that set of buildings just seemed ridiculous to me. On the one hand, I understand the author's curiosity and why people who are related to a Holocaust survivor would want answers about what happened to their family members and to discover information about their ancestry and where they came from. I know scattered bits about my own history and it's fascinating; my French ancestors were among the Protestants driven out of France hundreds of years ago -- same story, different place and religion. But, I don't understand why anyone would expect to have property that has been in someone else's hands restored to them a generation or two hence. So, I really kept hoping the author would just walk away from the property issues, do her research and tell the good stories. I didn't care about the buildings; it's the people that are important, in my humble opinion. Recommended? Yes, but with a warning that you have to be a little patient to get to the good stuff. I would call this an average read because I personally wanted to slap the author upside the head and say, "Give up on trying to get the building problem cleared up and just focus on the real story, the history of your family." But, that's me. I wouldn't tell anyone to avoid this book, but I will say it was not a personal favorite. It will, however, probably stick with me for a while. There are some haunting details that keep rolling around in my head. Anything else worth mentioning? The author was adamant that she had learned an important lesson: she went to Poland with a prejudice against Polish people and left with the understanding that humans are the same everywhere. She met and befriended some truly amazing, generous people. I was particularly impressed with the kindness of those who traveled with her, translating conversations and documents. Cover thoughts: The cover grabbed me because of the top photo. I wanted to know who those people were, whether they lived through the war, what stories they could tell. The building at the bottom is a clue that the story is not just about the people, but I didn't catch that. It's all relevant to the content and it works for me. I like it. Moving right along: For some reason I don't fully understand, I just signed up for Twitter. Why? I must be feeling lonely, which probably means I need to get a couple of kittens. Anyway, I haven't figured out exactly how one twits, but I already knew there was something wrong with me. Feel free to let me know what on earth I'm supposed to do. No great photos, this week. That weather was really something. I need to go on a field trip. Have a great weekend! Just a warning . . . if you get envious easily, have a nice little coffee or tea and one of those anti-anxiety pills because you are going to be so green with envy that someone's going to have to pry you off the ceiling. I'm just saying . . .
Now, on to all the wonderful wahooey goodness that I've recently received. This is so uber cool, I'm making myself giddy. First, I must share what the lovely Bellezza bought me for my Secret Santa Blog Swap gift. I don't think the enlarging feature works, anymore, so I'll tell you what's in the photo and crop a second photo to give you a closer view so you can drool all over your keyboard. Bellezza gave me a gift card for one Persephone book (!!!!!!!! ), two Persephone catalogs (one is not shown because I hauled it off to read it), a Starbucks gift card, a journal in my favorite color (apple green, 'cause she knows me well) and some unbelievably amazing chocolate mints. Her new kitty, Samantha, gave me the little magnetic paper clips with kitties on them! Wow, what a box full of awesome bookish yummy joy!!! Thank you, Bellezza and Samantha!!!! Bellezza also sent me a copy of The Guernsey Literary and Potato Peel Pie Society for my birthday (which was very, very much appreciated because I was especially feeling my mom's absence on my birthday). I actually carry that book from room to room, now and then, which I know is weird but I'm kind of just saving it for when I desperately need something I know is going to be wonderful to read. And, in the meantime, I admire it daily. The mints are seriously to die for. Carrie K. bought me all this wonderful stuff below just because. She said it's not a Christmas gift; she's just bought me some little things, here and there, this year. Well, if that doesn't make a chick feel all warm and loved, I don't know what does. She sent me a box of peanut brittle, a little woolen bag (hard to see, so I've got a separate photo of the bag, lightened up a bit, along with the socks she sent), a bookmark with a terrific quote and the face of John Steinbeck looking all weathered and gruff in a friendly way (my opinion), Famous Battles of the Civil War card game, a little wooden "dream box" with my name on it, and the cutest darned pelican socks you ever did see. And, now a thought. I've been setting aside books I've finished and don't plan to keep (which seems to be most of them, lately). I was thinking I might have a 100,000-hit celebration and give a few of them away, soon. What do you think? Hankering for a free book or two? Or should I donate? I do a lot of donating and swapping, but I've won so many books from blogs that I feel like it's time to share the love. No, wait, I'm not done! I thought I was finished frying my eyeballs and turning my brain to intersoup, but then I had to go check John Green's blog because he always makes me laugh. You have to see this, especially if you've read a book by John Green and/or have a certain level of pride in your nerdiness or have a fear or heights or, frankly, for any other reason you can think up very quickly. Actually, you should just watch it because it's hilarious and sort of really sweet. What led you to pick up this book? Brittanie sent me her ARC because she thought I'd like it and , oh, wow . . . she knows me well. I read the cover blurb and plopped right down immediately. Describe the book without giving anything away. When Catherine "Dilly" Carlson committed a crime that landed her behind bars for six years, her sister Hannah felt guilty. If only she'd have stayed Illinois instead of moving to California, the crime never would have occurred. Or, so Hannah believes. To atone for her absence, Hannah has spent years saving up the money to move home. Her objective is to be there for Dilly, but in order to do so she has had no choice but to leave behind a terrific job and the only man she has ever loved. Hannah expects her sister to be thrilled with the plan, but things have changed in a way that Hannah never could have anticipated. What did you like most about the book? My Sister Dilly is a wonderful story about faith, love, redemption, family, respecting people with disabilities, dealing with the past . . . lots of issues but they all fit together and the story is very nicely focused. I had a terrible time putting it down. What did you think of the characters? I cared about them and wanted to know what would happen. I did become a little weary of Hannah's justification for not returning to California when it became obvious that she had a very good reason to change course, but eventually Hannah makes sense of everything. Was there anything you didn't like about the book? I think it could have lost about 50 pages. Sometimes, there was just a bit too much everyday detail -- not a big enough problem to put me off, though. Also, I had a little trouble with the POV switches. The book is primarily Hannah's story, but it occasionally switches to Dilly's perspective. However, toward the end I thought it became clear why the author made the choice to occasionally switch to Dilly's point of view. Recommended? Highly recommended. I think it's a beautiful story in too many ways to list. Anything else worth mentioning? It's a Christian book and you can expect talk about God, but the main character has spent years rebelling against her Christian upbringing because of her Bible-thumping, rule-enforcing, and somewhat cold parents. Hannah spends most of the book feeling confused and ambivalent about God. On the flip side, Dilly believes she would never have survived prison if she hadn't rediscovered Jesus. Cover thoughts: I like the cover for its looks; I think it's lovely. But, it doesn't entirely fit. Hannah and Dilly were raised on a farm -- a hog farm, though. To my knowledge wheat fields aren't all that relevant to the story, even though it takes place in the Midwest. On a side note, I love wheat because it reminds me of home. Wheat and a big, wide open sky . . . probably one of my favorite sights. Also, I have to mention that when the author described the hog farm, her description was so vivid I still imagined I was smelling manure for an hour after I put down the book. What do you think? I always talk about the religious element of books (including, recently, a book that was very pro-Buddhist) and whether I consider a book preachy or heavily religious because I think that's something people tend to want to know about. How about you? Does Christianity in a novel effect whether or not you'll consider reading it? If so, do you feel that way about other religions and how they're portrayed? Just curious. My library has an interesting identification system. 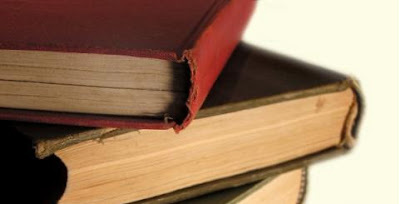 The Christian novels have a little picture of Jesus on the spine. Sci-fi novels have a little space-age symbol, Westerns sport a pair of boots with spurs, mysteries and romance . . . can't remember, but they have their own little spine emblems, too. I love that! It's nice to have that extra little bit of information when you're browsing. Cattery Row by Clea Simon - won in a drawing at Thoughts of Joy. Thank you, Joy! Cruel Intent by J. A. Vance - Sent by Simon & Schuster - I'm not sure about this one, as I've never read the author. Are her books nightmare-inducing? Warn me, if they are, somebody. A parcel from Carrie K., who is one of my bestest best blog friends because she she's witty and fun and has a great cat whose portrait I'm going to take, someday. I'll take picsof the bounty and show you, tomorrow, if we're not out playing in the snow that is allegedly due to arrive any moment now (none of us are holding our breath). Actually, we're getting tons of Mississippi Snow . . . the melted kind. Also, I have to show you what my wonderful, amazing Secret Santa Blog Christmas Exchange Pal gave me! Bellezza, another blogger I adore and count as one of my bosom blogging buddies was my Secret Santa. It's all so very, very perfect. Oh, and I was going to save everything for Christmas, but I couldn't wait and ripped into it. Thank you, Bellezza! More on that, later. I've been out doing my part helping the economy, today, so I haven't read a word. I'd better hush up and do that. Sorry about the lack of wahoos. Busy, busy, but I'll make my gifties my belated wahoo. Have a wahooey day! Labels: book reviews, recommended, What do you think? If the title and cover of this book aren't enough to grab you, you must really hate history. I love history but I'm deficient in the subject matter and have spend a good portion of my adulthood trying to figure out how to overcome that annoying little educational black hole. Covers like that of King George: What Was His Problem? really knock my socks off. History presented in an offbeat, entertaining fashion? Irresistible. "Huzzah for the Americans" shouted the French soldiers. Then about a hundred American and French cannons opened fire. The French cannonballs smashed right into buildings in Yorktown. Many of the American cannonballs plopped into the river or landed in empty fields (the French had a lot more practice at this stuff). I've got to go return this one to the library, quick like a bunny, before the raging storms that are allegedly bearing down upon us arrive. If we don't blow away, I'll be back to posting and visiting blogs, tomorrow. But, for now . . . off goes the computer. Have a lovely Tuesday! How cool is that? I have meant to take a photo of an individual slice, but whenever I cut myself a piece I just can't be bothered to grab the camera because I end up rolling my eyes in ecstasy and then suddenly my slice is gone. This pie is really absolutely perfect -- just the right amount of sweetness, not enough so that it'll make you queasy, with a light, perfectly-flavored, flaky crust. Shoot, I could just sit and munch on the crust, alone, all day. I highly recommend ordering from Mom's Apple Pie Company if you're looking for a nice dessert to send someone for Christmas. Or, for any other reason. Bookwise: I am all over the place. Yes, I'm a bit of an ADD reader, anyway, but usually I can focus enough to complete the reading of a book every 2 or 3 days. This month has just been Attention Deficit Goes Insane. I'm currently reading 7 books. I'm enjoying every single one of them, but I'm doing sort of a musical books thing . . . read a little of one book, put it down, read a little of another book, set it aside, read a little of another. On and on, round and round we go. Stories from the Heart by various authors -- Much like a Chicken Soup for the Soul book, this book (published in 1996 by Multnomah Books) has short entries about faith, family, love, etc. Some are deeply touching and brought tears to my eyes. A few made me smile or laugh. A couple were familiar, but I haven't the foggiest idea where I may have read them. The book is no longer in print, as far as I can tell, so I was unable to locate an image. I kept it in the bedroom and just read 2 or 3 entries per day, pinches and bits till it was done. 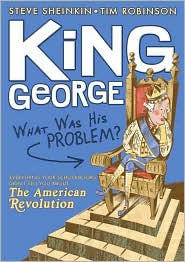 King George: What Was His Problem? by Steve Sheinkin, Illustrated by Tim Robinson - This is a Young Adult nonfiction book that I snatched up at the library and it's due quite soon. The author says he used to write textbooks; for years he set aside all the interesting stories that his bosses would have probably fired him for adding to those dry old school books. Whilst laboring away at organizing boring facts, dates, charts, and other things he knew would likely put students to sleep, he set aside the stories he liked --the stuff that makes history rock -- and now he's writing a series of fun books. All history should be this enjoyable to read. Queen of the Road by Doreen Orion - The true tale of one couple's travels around the U.S. in a converted bus. And, by converted, I mean "ridiculously luxurious". The fact that the author is all about fancy brand names and that she and her spouse settled on kitchen counter material that cost $320 per square foot (it was, in fact, harvested underwater) combined with the author's breezy -- if a bit uppity -- style gives this book a bit of a chick lit tone. I'm enjoying it, but . . . let's just say I can imagine the head-to-toe scan the author would give me if I entered her territory, and that puts me off a bit. 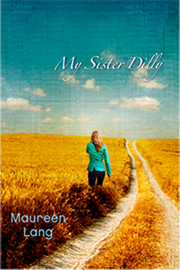 My Sister Dilly by Maureen Lang - This one's a novel. Hannah loved her life in Los Angeles, but since her sister Dilly's conviction for a crime she probably wouldn't have committed if she'd just had a bit of help from friends and relatives, Hannah has planned to return to small-town Iowa to atone for her absence when Dilly desperately needed her. Things aren't turning out quite the way she planned, though. This book is so good. Brittanie sent it to me because she thought I would like it and so far it's wonderful. Thank you, Brittanie! Hurricane of Independence, Fear in North Carolina, The Pages in Between and Enslaved by Ducks -- Wow, I had no idea I read so much nonfiction, truly I didn't. Each of these are interesting for completely different reasons, but Enslaved by Ducks is decidedly the most fun and the one I'm picking up most often because I like to laugh and I love animals. It's a light-hearted book about pet ownership. This is weird: I love bath fizzies and keep a pretty decent supply. Walmart has some 6-packs of fizzies in their Christmas package section and my friend Judy likes smelly bath stuff, as well, so I bought several -- two for gift-giving and one for myself. I tried one out and its fizz fizzled. Meaning, it worked for a while and then just lay there, a cratered lump on the bottom of the tub. It left this odd-looking streak of purple bleeding across the enamel and there wasn't much scent. Bizarre. I'm taking the other two 6-packs back. I've never encountered fizzies that didn't work, before. Judy has read one book the entire time I've known her, whilst her husband reads approximately one book per day (sometimes more) or I'd buy her a book, of course. Poor Judy. I hate to think what she's missing. Speaking of which . . . gotta go. And, I'm going to use something I know smells good and fizzes till it's gone, this time. Happy reading! I no longer have small children in my house, but picture books for youngsters still are a great joy to read. I'm especially fond of beautiful illustrations. The Dragonfly Secret is stunningly colorful, definitely a beautifully illustrated book. You can peek inside the book to see a bit more of the gorgeous color illustrations at Amazon, here. Warning: The next paragraph contains spoilers because I don't think it serves any purpose to tippy-toe around the subject matter. Please skip the following paragraph if you don't want to know what the book is about. 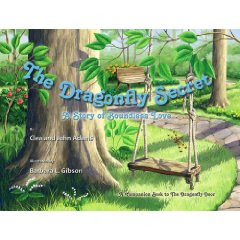 The Dragonfly Secret: A Story of Boundless Love tells the story of a dragonfly who sends a message of hope to the parents of a child who has passed away. Lea the dragonfly flits from the boy's hat to the bear in his father's pocket; and, by these simple gestures the young boy's parents understand Lea's actions as a message from beyond. It's really quite a sweet, simple story designed to comfort youngsters who have experienced loss. It's safe, now. You can read, again. The information at Amazon says this book is for children aged 9-12. I would say it's actually for significantly younger children, but my own children were rather advanced so I may be a tad off. The book is short and simple enough to read to younger children (possibly as young as the age of 4) or easily read by early readers who are on the verge of reading chapter books. It sends a simple message of hope. I believe The Dragonfly's Secret could be a very effective tool for helping children to cope with loss, whether one is related to the child who has experienced loss or works as a counselor. What led you to pick up this book? I read Kathryn Cushman's first book, A Promise to Remember, a couple of months ago, and loved her writing style. Fortunately, she obliged me by immediately producing a second novel. Describe the book without giving anything away. Paige is a pharmacist who once made a simple mistake that dramatically changed her life. Now, with an ailing mother in need of money for special treatment, Paige feels obligated to keep her history quiet when a new job opportunity with excellent pay comes along. But, the past has a way of coming back to haunt you. Clarissa has led a charmed life and dreams of opening a new pharmacy in her grandfather's building. But, first she must prove herself as a pharmacist. When Clarissa's grandfather hires Paige to help out at the pharmacy, Clarissa does everything in her power to drive the intruder away. Will Paige continue to ignore Clarissa's arrogance and the dangerous errors that could hurt the patients who are their customers? Or, will she speak up and risk the loss of everything, including her mother's health? What did you like most about the book? I love Kathryn Cushman's writing style; her books have a smooth flow that makes for quick reading, but she tackles tough themes. Also, there's always the question of "preachiness", when it comes to Christian lit, and I didn't find it preachy at all, although it was a little heavier on Christian elements than some of my recent Bethany House reads. While I strongly feel that nobody wants to read a thinly-disguised lecture about anything, including personal agendas that have nothing to do with religion, Christian writing is held under the proverbial microscope in a way that authors of few other genres have to deal with. Dean Briggs wrote an excellent post about the topic, entitled "Writing Beyond the Secular/Faith Barrier" at Breeni Books, this week. I highly encourage you to check it out. What did you think of the characters? Cushman does a great job of creating characters who are Christian without pushing an agenda. I liked Paige a lot because she was going through some very challenging circumstances but she did her best to stay strong. As part of her struggle to keep up the faith, she carried cards with Bible verses to work, something I've never managed to get around to (but have thought about . . . shoot, I even have plenty of cards lying about). There is also a wonderful, quirky character that I just adored in Waiting for Daybreak -- Ora, one of the customers, who readily recommends Bible verses by their location (book and verse number) but doesn't have the actual words memorized. While I'm not quite sure the author meant to say this, I thought the fact that those verses didn't always apply was a good example of how Christians often mean well but are totally off-base . . . human, in other words. Was there anything you didn't like about the book? It had a bit of a sagging middle. And, it was a little hard reading about Paige's mother, since my own mother attempted to get into the well-known treatment center at which Paige's mother received her therapy. But, the cancer bit was simply a part of Paige's characterization and was important to the plot without the book becoming a "cancer book", so I never felt like tossing it aside because of either the cancer (which usually drives me crazy if it's central to a book's storyline) or the mother-daughter relationship. I did, however, feel like the fact that Paige's mother was treated far from home meant the pressure of the illness had a little less impact on the story. Recommended? Absolutely. Waiting for Daybreak is a good story. I'm looking forward to seeing what this author comes up with in the future. 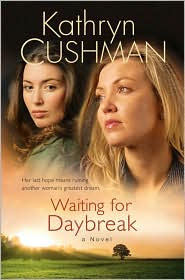 Cover thoughts: I wasn't thrilled with the cover when I saw it because Cushman's first cover also had a two-chick thing going, but it turned out to be every bit as perfect and relevant as that of A Promise to Remember. "If you lived in a city back in those days, and an army was outside the walls, when do you reckon would be the scariest time?" "When the enemy started shooting arrows?" "No. It would be in the dead of night, when you couldn't see a thing, but you could hear the clanking of armor as enemy soldiers surrounded your city, and the heavy footsteps of who knows how many. You're not sure what's out there, but it sure sounds like it's going to be bad. It's the time you'd want to get out of the city and quick, right?" "But see, this is all about staying and standing your ground. Things sound bad now and you've got no idea what terrible things are out there, but God's gonna help at break of day. You just got to have enough faith to stand firm all night at the city wall and wait for daybreak." Isn't that wonderful? Thank you, Bybee, and heads-up to the Webster's people. Before I totally forget, you really need to dash over and Estellify Yourself, if you haven't already. Yes, a new issue of Estella's Revenge is available for your reading pleasure! Wahoo! Oh, oh, oh! This week I found a bookmark, upon the back of which I had written vocabulary words with page numbers. Has anyone else ever used a bookmark to keep track of vocabulary words? I did that for dinosaur years -- wrote the words, sometimes with an accompanying phrase, on the back of a bookmark and then defined them in a notebook when I finished each book. Because, let's face it, I'm a serious nerd. That's a good thing, in my opinion, as you may have noticed that a few very special nerds commonly make (and often generously share) excessive fortunes. Bill Gates comes to mind. Definining words in a notebook must have helped to expand my mind a bit, because only one of the vocabulary words on the back of that bookmark made me squeeze my eyebrows together, that being the word "penetralium". No photos, today. I am still dragging and plan to sleep late for a couple of days to see if that helps. The husband is back from Florida! Wahoo! I can be a bum, again! Oh, no, I can't because I have Christmasy things to do. Well, it was a nice idea. I'm off to bed in my cozy penetralium. Very soon, I shall tell you about a pie. But, don't hold your breath because I need to get some sleep, first. Later, gators!